Francisco Solano y Jiménez, O.F.M., (also known as Francis Solanus) (10 March 1549 – 14 July 1610) was a Spanish friar and missionary in South America, belonging to the Order of Friars Minor (the Franciscans), and is honored as a saint in the Roman Catholic Church. He was born 10 March 1549 in Montilla, the third child of Mateo Sánchez Solano and Ana Jiménez. He was educated by the Jesuits, but felt drawn to the poverty and penitential life of the Franciscan friars. At the age of twenty, he joined the Order of Friars Minor at Montilla, entering the novitiate at St. Lawrence Friary, which was located in a place of great natural beauty. The community there belonged to the Reformed observance within the Order, following a very strict routine of prayer, silence and fasting. Francis followed this regimen rigorously, always going barefoot, abstaining from meat, and wearing a hairshirt throughout that entire year. As a result, however, his health was permanently affected, leaving him sick and fatigued. Solano was solemnly professed at the end of his novitiate year, on 25 April 1570. He was then sent to the friary of Our Lady of Loreto in Seville for his seminary studies. There he learned not only philosophy and theology but developed his musical talents. He was ordained in 1576, a ceremony his mother was unable to attend due to her poor health. He was then named Master of Ceremonies for the community. Still a lover of simplicity, Francis made a small cell for himself by the chapel of the friary, made of clay and reeds. After completing his final theological studies, Solano was assigned as an itinerant preacher to the surrounding villages of the region. He was eventually given a license as a confessor. During this period, he requested that he might be allowed to go to North Africa, with the hope of achieving martyrdom for preaching the Catholic faith. He was denied this request. At that point, Solano shifted his vision to the American missions. After the death of his father, Solano returned to his hometown of Montilla to care for his mother. During that time, he gained the reputation of a wonderworker, as a number of people were cured of their afflictions through his intervention. He tended the sick and dying during a 1583 epidemic in Spain, never worrying about his own health. Spanish Emperor Philip II requested the Franciscans to send missionaries to preach the Gospel in the Americas. 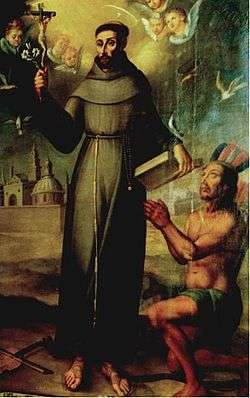 In 1589 Solanus sailed from Spain to the New World, and having landed at Panama, crossed the isthmus and embarked on a vessel that was to convey him to Peru. During the journey, a storm at sea crashed his ship against the rocks not far from Peru. The crew and the passengers abandoned the ship, but Francis stayed with the slaves that were on board. After three days, they were rescued. For twenty years Solano worked at evangelizing the vast regions of Tucuman (present day northwestern Argentina) and Paraguay. He had a skill for languages and succeeded at learning many of the regions' native tongues in a fairly short period. It is claimed he could also address tribes of different tongues in one language yet be understood by them all. Being a musician as well, Solano also played the violin frequently for the natives. He is often depicted playing this instrument. After that came Solano's appointment as guardian of the Franciscan friary in Lima, Peru. Further, he filled the same office for the friaries of his Order in Tucuman and Paraguay. Around 1601 he was called to Lima, Peru, where he tried to recall the Spanish colonists to their baptismal integrity. It is said that Solanus predicted the devastating 1619 earthquake of Trujillo, Peru. He died at Lima. Solanus was beatified by Pope Clement X in 1675, and canonized by Pope Benedict XIII in 1726. His feast is kept throughout the Franciscan Order on 24 July (except currently the United States, where it is celebrated on 14 July). Francis Solanus is the patron saint of Montilla. The Parish Church of San Francisco Solano is built on the site of the former house where he was born. He is also patron of Argentina, Bolivia, Chile, Paraguay and Peru. Mission San Francisco Solano, the northern-most mission along California's El Camino Real, was named in 1823 for Francisco Solano. In Humahuaca, every day at precisely 12 noon, on the city hall belltower, heavy copper doors slowly open and a life-sized animated wooden, dramatic-looking statue of San Francisco Solano appears for about two minutes and gives his benediction to the silent crowd amassed on the village plaza. This article incorporates text from a publication now in the public domain: Herbermann, Charles, ed. (1913). "St. Francis Solanus". Catholic Encyclopedia. New York: Robert Appleton. Wikisource has the text of the 1913 Catholic Encyclopedia article St. Francis Solanus. St. Francis Solano at "Saints Alive"